This is a long and flat ride on a paved recreational trail. Coyote Creek Trail starts on Tully Road in San Jose and roughly follows Highway 101 (not to mention much more closely following Coyote Creek) southeast for about 18 miles. This out-and-back ride is the longest ride I've ever done on a trail of this kind. 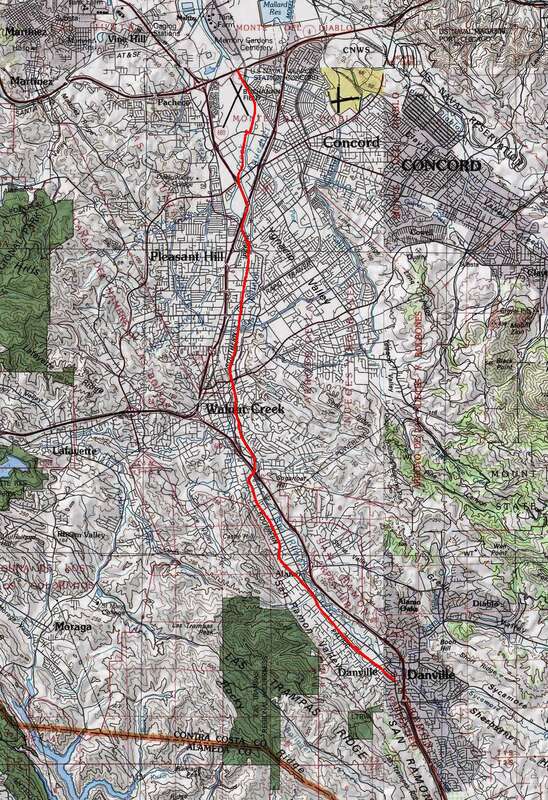 The ride actually traverses "Coyote Creek Trail – South" as designated by the San Jose parks website. There is also a (disconnected, much shorter, and gravel-surfaced) "North" segment of the trail north of Montague Expressway, as you may see on that site. Even the southern segment extends three miles further north than the starting point of the route described on this page. I picked this starting point due to its easier parking, rather than insisting on starting at the northernmost tip of the trail. The suggested parking spot linked on your left is one of the lots of Hellyer County Park. You need to pay a fee to park here. The fee, which is collected by an attendant at a booth at the entrance, was six dollars the last time I did this ride. I'm a big proponent of supporting our local parks by a willingness to pay these day-use fees, since, as bikers, we're among the first to benefit if our parks are doing well financially. But, if your preference is to look for free parking (due to repeating this ride with very high frequency, perhaps), I'm sure that finding some free street-side parking in one of the suburban neighborhoods to the west and to the south of the park and pedaling in from there should be a very simple matter. Also note that, while the Suggested Parking link on this page points to the part of Hellyer Park north of Hellyer Avenue, the part of the park that's to the south of it (with its separate entrance booth) actually features more parking spaces. The ride starts out inside Hellyer County Park. One interesting tidbit even before you set out on the ride is right in this park: I hadn't known of the existence of a velodrome here before doing this ride. But, there it is, right by the suggested parking spot. Neat! You'll notice that the GPS track actually circles around the velodrome before setting out on the actual ride. That's not because there's anything that is interesting to see, since there isn't. At least not from the outside. It's only worthwhile if you need to satisfy your curiosity. Coyote Creek Trail doesn't take long to leave Hellyer County Park on its way southeast. It passes through several more small urban parks along its length, but for the most part, it exists as its own lone path that follows the creek from which it gets its name. The initial few miles of the ride are relatively shady and nice. As you go farther south, it becomes mostly bare and exposed, though there's hardly ever any shortage of shrubbery or even wetlands around you (just not as much cover above you). Still, you should be able to find enough tree cover at least for a shady rest stop almost throughout this entire ride route. The entire length of the trail surface is paved, with a dashed stripe down the middle. Feel free to bring along the non-biker family members and small children pedaling their own bikes. If you end up having to turn around before finishing the entire length of this route, that will only be because of sheer distance covered rather than any difficulty factor of the ride. There are something like three crossings of public streets along this route, which will be your only interaction with traffic. While that should be enough to be careful about not letting off-leash toddlers too far out of your line of sight, all three of these crossings are on very minor roads with nearly non-existent traffic. In terms of elevation change, the ride is almost completely flat on average. As you can see from the elevation profile plot, the ride has barely 250 feet of net elevation gain in 16 miles. This doesn't mean that there aren't some "blips" on the graph where you climb 5 or 10 feet (or 20 on the rare occasion), but none of them are memorable. Still, at least as calculated by the software that I use, those insignificant undulations along with the net gain add up to around 800 feet of total climbing over the entire ride. The trail seems to be popular mostly with cyclists and joggers. They appear to be the most common users of the trail, though more casual trail users are still occasionally encountered. Since the trail passes through a number of neighborhood parks along the way, picknickers and parents with small kids can be found in higher numbers around those segments of the ride. The official speed limit for bicycles on the trail is 15 MPH. While the trail is suitable for speed, with enough width to pass oncoming bikes and pedestrians without causing hair-raising moments, this is more true in the southern reaches of the trail where it is straighter, smoother, and a little less crowded. One piece of advice passed to me on my last ride here by the entrance booth attendant might be worth repeating: "watch out for the tree roots". While, at first, this might seem to be odd advice for a paved trail, it turns out to be fairly relevant. The first couple of miles of this trail suffers noticeably from folds in the pavement caused by tree roots, if not also by some other surface deformities. It's not to any abnormal extent. It's just that there are noticeably many instances of this. A lot of these are reasonably mild bumps, though their prevalence can still get annoying. A handful of them, though, are pretty seriously sharp and can be quite jarring when you hit them unexpectedly at speed if you're riding on skinny tires. Since the ride starts in South San Jose and extends basically to Morgan Hill, it might be stating the obvious to point out that this area can get pretty hot in the summer. Typically, temperatures around here are easily a dozen or more degrees higher than most other areas closer to the bay. So, you might want to keep that in mind if you are thinking of doing a ride here on a warm and sunny day. The few points of interest along the length of the trail will include a couple of sets of lakes where people do fishing, skirting around the Coyote Creek Golf Course, one potential water crossing, and a radio-controlled model airplane flying area (Santa Clara County Model Aircraft Skypark) near the turn-around point of the ride just before the last crossing under Highway 101 on your way out. If you're left looking for more mileage of a similar kind after completing the ride, one obvious way of extending this ride would be to continue northwest along the part of Coyote Creek Trail between the velodrome and Tully Road. The southeastern tip of Coyote Creek Trail (where this ride turns back) also happens to be right at the doorstep of Anderson Lake County Park, though there's very little trail mileage in that park; it would mostly make sense if what you're after is some relaxation by the lake. The only other extension option to which I can point is Silver Creek Valley Trail. (Its PDF map can be found here.) This is a similar paved recreational path. It starts from the eastern corner of the intersection of Silver Creek Valley Road and Hellyer Avenue, and closely follows the former road (initially so closely as to look like a sidewalk). Coyote Creek Trail crosses Silver Creek Valley Road right near the only hairpin curve on this ride. The beginning of Silver Creek Valley Trail is only a couple of blocks away from there. This extension would add a hair over three miles (one way) to your ride, or more like four miles if you also include the fork along Farnsworth Drive. What's not similar to Coyote Creek Trail about this extension option, though, is that it's not flat. This trail would add about 600 feet of climbing to your ride totals on the way out, and something like another 400 feet on your way back. More importantly, though, the climb is no joke, averaging nearly 10% grade for half a mile on your way out, and featuring a 400-foot-long segment averaging 20% grade on your way back. So, this option would only work for riders in good physical shape.